Let’s get this on the table right up front: West Seattle should receive a light rail line in the next Sound Transit funding package (ST3). STB has covered this issue before with articles about possibilities, options presented, and even the hazards of regionalism. What might actually be included in the next regional package, and how does the study presentation impact the ST board’s decision? We think that a better presentation of the information contained within this study would serve the Sound Transit board and West Seattle well when it comes time to select corridors for ST3. As currently presented, the study makes the West Seattle line appear less cost effective than it should be. Seattle Subway has some suggestions to improve this. As others have noted, this study is comprehensive to the point of being difficult to comprehend, and contains routes and options that cost more than $8 billion and are well beyond what the region will build in near future. We have two main requests to help make this information easier to understand and analyze. This option would connect the West Seattle peninsula to downtown and the rest of the regional rail system with stops only at the Alaska Junction and North Delridge. 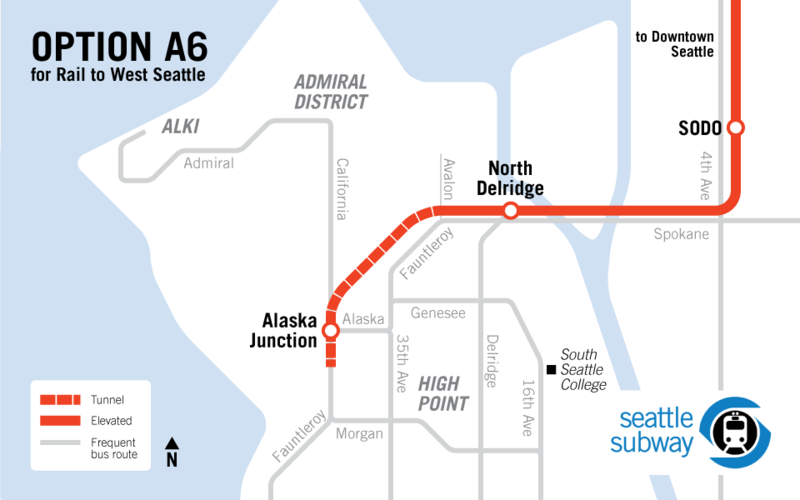 It is similar in concept to the northernmost portion of Sound Transit’s Option A5, but with the addition of a North Delridge stop. It would allow for future expansion, as funding beyond that included in ST3 becomes available, into a long tunnel much like ST’s Option A5 or David’s proposed corridor. This option should identify future rail options and be built with expansion in mind. The intention of A6 is to find the least expensive/highest performing fully grade separated rail option to locations that allow for frequent bus connections. The North Delridge station is crucial to good bus connections, as Route 120, West Seattle’s highest-performing bus line, could not connect to the line otherwise. It would also allow for much easier connections to South Seattle Community College, White Center, and Westwood Village. The Alaska Junction station would allow for connecting bus service to most of the rest of West Seattle, including a frequent route that would duplicate the remainder of today’s RapidRide C Line; a more frequent version of Route 50 to Admiral and Alki; a more frequent version of Route 128 to High Point; and other less frequent service to lower-demand neighborhoods. The option allows better service to more of West Seattle than any of ST’s existing options, and given its short length should be affordable in ST3. 2. Present the costs of the new Downtown Transit Tunnel separately from the West Seattle segment. Several routing options for new tunnel segment from the International District Station to Westlake were also presented as part of this study. We think those options and their costs require a more in-depth presentation. The section of the new downtown tunnel from International District to Westlake has its costs and options buried within this study. The downtown tunnel options are expensive and largely separate from routing concerns in West Seattle. It’s critical that the board fully understand the options. All three of the Seattle corridors that ST has studied (Ballard to UW, Ballard to Downtown, and West Seattle to Downtown) are critical to Seattle mobility and should be included in the ST3 plan. North King County will potentially have enough capital to complete all three corridors due to subarea equity and federal grant eligibility. Today, West Seattle suffers from lack of resilience given the low number of Duwamish crossings and their susceptibility to disruption. When the West Seattle Bridge experiences major issues, it can cause serious headaches for the entire peninsula. Having another option – one with the speed and reliability that only grade-separated rail can provide—to connect West Seattleites to downtown Seattle and beyond would go a long way to solving that issue. That is why we urge Sound Transit to present options to the Sound Transit board that focus on getting rail to the peninsula and make the costs and options related to the downtown tunnel sections of the line fully separate and apparent. 1. I want rail to West Seattle! Study “A6” to North Delridge and the Junction. 2. Building a high quality line is the most important consideration in this corridor as it is a high value corridor with possibilities of future expansion and would significantly improve the transportation options for West Seattle. 3. Study driverless subway technology to control costs and increase flexibility in operations. This post was written with contributions from David Lawson, Oran Viriyincy, and the Seattle Subway Communications Team. I am not a fan of this alignment. I like the idea of keeping it short and simple to maximize the ridership, but I also think that all of the alignments so far have missed one key area: Admiral. I think that one key goal of urban rail should be to connect Seattle’s urban villages. The urban villages are not random — they are the places specifically designated as being the nodes of the city. Thus, I think it’s unfortunate to have a rail line that gets close to, but does reach admiral. And honestly, if we don’t build it now I doubt it will ever get rail. I think that 100% of the other urban villages in Seattle have a strong chance of getting rail. It would be sad to see this one left out. It we were talking about an at-grade route, I could understand why it would be technically challenging. But given that this is a combination of elevated and tunnel, there shouldn’t be anything particularly challenging about serving Admiral — instead if having the tunnel initially going southwest it firsts goes northwest and then turns south. Moreover, I think that one of the other key advantages of considering rail is it can make connections that are typically hard to make via bus. Due to surface geography it would be hard to serve Junction > Admiral > Seattle with a frequent bus line. But for an underground tunnel it’s just a small deviation — connecting all of the urban villages of West Seattle together and to downtown in a way that wasn’t possible before. Let me guess… You live near Admiral Junction, right? But lets think about that for a second. The Admiral area is a failry affluent neighborhood, and it is a well established fact that people in affluent neighborhoods tend to take mass transit far less than people who are less well off when it is available to them. So why should we spend the money to build a elevated/tunnel extension to a neighborhood that will have fairly low ridership when neighborhoods like the Alaska Junction, Delridge, and White Center, that all have higher population densities (note that there are very few condos or apartments in Admiral) with populations that are much more statistically likely to actually ride transit if available. Also, note that it is about a 1.5 mile, downhill walk from Admiral to Alaska. That should take you about 15 minutes to walk. Or there is always the option to have Metro put in a shuttle that could pick you up and drive you that short distance. If the ridership is actually there to support it, Metro could even make the shuttle ride free. And the walk is even downhill both ways, right? You clearly have never walked 1.5 miles before. 15 minutes (AKA a 10 minute mile) would be a good time for a casual runner in their first 5k race. He also spectacularly overestimates his own walking prowess. Human walking speed is 3.1 mph, and Seattleites seem to walk slower than most. That said, he’s otherwise correct: Admiral is a ridiculously minor node, even by the standards of decentralized West Seattle. Heck, even West Seattle’s “flagship” junction isn’t among the city’s dozen largest, densest, or most active nodes. We need to start having an honest conversation about West Seattle and its false equivalence with the truly busy and all-hour-transit demanding parts of this politically mis-weighted city. Is the Admiral District affluent? Not the shopping district, bars and restaurants… not West Seattle Highschool… not all the cheap apartments in the 5 or 10 blocks surrounding Safeway. It doesn’t get affluent until you get 5 or 10 blocks out of the business district and away from the highschool. I don’t live in West Seattle, but I can’t imagine building light rail there without hitting both the Admiral and Junction areas. @Stephen — I think you put your finger on why light rail to West Seattle is so challenging. It is extremely expensive just to get to the peninsula, and there is nothing in between there. If built, there would be a two mile stretch without a station. That is just not good when it comes to a light rail system. Then, once you get to West Seattle, the densely populated areas are not easily served. Admiral is a worthy location, as is Alki. But Alki is simply out of the way. Stringing together most of the neighborhoods along California makes more sense. Looking at the census map, I see four good stops along there. But heading north to head south adds a lot of cost. I wouldn’t mind studying it, but I fear that the result would be very disappointing. The combination of scattered destinations and a huge gap between the rest of the system dooms light rail to West Seattle, in my opinion. At some point it might make financial sense, but I don’t see that happening for a long time. I’m the guy that keeps saying that SODO Station needs to be built up as a hub for bus to rail connections. Admiral and Alki would be a short bus ride away from SODO if the ridership were there to fill the buses. I’m the guy that agrees with that guy. West Seattle is just so appropriate for bus improvements (call it BRT if you will) and so poor for light rail that it just makes more sense to improve the bus experience. Using the SoDo station as a hub is a huge part of that. I’ve taken the 50 from SODO to Alki (which actually also runs from Othello Station, the stop near my home, to Alki) and it was great. I like this idea. I think Admiral and Alki would be an even shorter bus ride to a Light Rail Station @ the Alaska Juction. This would also avoid a bus bridge crossing. A 50 to SODO often gets mixed in the bridge hassle as well as the Lander St. rail crossing. I’ve always felt the Admiral Junction area gets the short shrift in transit planning decisions. But the area immediately around Admiral junction that has so much potential for densification. Under this plan, there is only 1 stop on the plateau at Alaska Junction. Bus services would need to be realigned to feed traffic to it. While not a perfect solution, I’m ok with that. But what I’d also like to suggest is that a streetcar segment from Morgan Junction to at least Admiral Junction be installed, with a possible extension to Alki. I like that idea. A California Ave Streetcar! Admiral violates the Jarrrett Walker prinicple of “be on the way”. Any detour there will increase either travel time or headway unacceptably for those farther along. Sorry, Admiral residents have voted with their feet to use transit lightly. Metro ran route 56 east-west and route 55 north-south through Admiral Junction half-hourly for decades with minimal off-peak ridership. Sadly, Admiral is not in line for rail transit if it can’t fill half-hourly buses. In the last restructure, Admiral off-peak service hours were shifted from downtown service to connections at the West Seattle junction. This makes it much more time consuming and less reliable to reach downtown, but sets up Admiral for a future with light rail service to the West Seattle junction. 1/2 hourly is not frequent transit and I argue for east/west connections at least 15 mins during the day/early evening are necessary to be useful. We would have to knock out a lane of traffic to do a street car on California–eliminate the north or south lane? With the potential to make bus service, e.g., Rapid Ride, very difficult to execute. I also insist upon for 15 minute headways for east/west connections while condemned to bus service. Another this to consider, will there be a NIMBY fight from the Admiral area homeowners? Do they want the development that will surely come with having an actual rapid transit stop there? We are talking about housings in the 600K-infinity price range. By passing Admiral keeps the development concentrated south. And it would still relieve a huge amount of commuting from the south. Thus giving them back their precious bridge. I have to admit that I have many reservations about this method of building subways (light rail) in our city (conurbation). I worry that if we don’t commit to something more substantial (like that route proposed by David), we risk a failed attempt and the demise of future extensions. I know that bold plans risk failure as well, but this is to little to make the real impact that is needed in West Seattle. We think we should commit, long term, to building those lines. The heart of our post is about need to get to west seattle despite other priorities – we are worried it will fall off the list if a chewable option isnt presented. Even this is going to add to the price tag a lot. Just getting another connection across the river is a big win. The development will certainly center around the stations. Look at Capitol Hill. The entire neighborhood has one station. All in tunnel, the time it takes to get to West Seattle wouldn’t be bad, and the number of communities and people served would be completely worth the route. You say the time wouldn’t be too bad in a tunnel… but how much worse would it be? I’d like to see figures before saying it’s worth it to go in this roundabout way. Myself, I think a gondola across the harbor to Alki Beach would be a better way to serve it than putting it on the end of a hugely circuitous line. There is no way in the world that the Coast Guard is going to allow you to foul the approaches to the Port of Seattle with gondola pylons. FORGET IT! Hmm, you’ve got a point. Too bad; the geography seems otherwise well-suited for a gondola. But I still think downtown to Alki via South Park is much too far out of the way. I like the first half of that idea, especially if it could be built cheaply. I’m afraid it might not pencil out, though. Like a West Seattle line, you would still have a huge gap between stations (Georgetown to SoDo is about two miles). Georgetown and South Park don’t have that many people in them. White Center has more, but now a line would likely be expensive (it might half to be underground by then). Meanwhile, for the vast majority of riders in West Seattle, their current bus would be faster. Streets like 35th aren’t bad, and the freeway is just as fast as light rail (traffic notwithstanding). I’m afraid that going south to go north just wouldn’t make sense for folks in, say, the West Seattle Junction. It is 0.6 miles from there to the freeway on-ramp, so if a bus can slog its way there in five minutes (7.2 MPH) it could beat the train (circling around) to SoDo. Get some value out of the new south park bridge, cover social justive by serving a lower income community and some jobs in South Park, and loop around north at a later date to serve the wealthy neighborhoods towards Alki. You also get the delridge corridor with a one stop in white center. You guys want to rebuild the A to Far Rockaway. Problem is, West Seattle ain’t Brooklyn, see? Yes, if you’re going to go into West Seattle then you should plan on hitting the key destinations — the Ferry and the Beach. And also it should go all the way through and exit the south end and hook up with SeaTac’s line. I mean, talk about density and use of public resources? I pains me that it’s so difficult for residents — who pay for all these beaches in taxes — to actually get to the parks and utilize them! And that’s a statewide issue. @Gordon: How would you plan to cross the duwamish with that proposal? A bridge tall enough to meet clearance requirements would be expensive and difficult to bring back down to serve South Park. And a drawbridge would create reliaibility problems, particularly going northbound where riders at the numerous downstream staions would rightfully have the expectation that the train will not be delayed for ten minutes while the draw bridge was up. There is a very large gap between SoDo and Delridge (over two miles). Building a big light rail viaduct isn’t that cheap, but is a bargain compared to the tunnel. I’m afraid that the cost per station will be really high. Then there is the small issue of how people get from the Delridge station to the bus. I’m guessing that the station will be 50 to 150 feet above the street. Adding stairs, escalators and elevators will solve that problem, but not without a price, both financial and in time. While I think this could improve the bus situation, I don’t think this would improve it that much. A Delridge station is right next to a freeway ramp. If improvements were made from there to SoDo (which would be much cheaper than extending the light rail) then a bus could easily get to SoDo as quickly as a train. In other words, if the Delridge bus simply kept going to SoDo, then a rider would be better off staying on the bus until SoDo, rather than taking the escalator up to the train station at Delridge. What is true of Delridge bus is also true of most of the other routes. For example, a bus on 35th can simply keep going and get on the freeway a couple minutes before it could get over to California. Obviously you could reduce the length of the bus routes, thus increasing frequency. But this is where those two minutes are important. It is about three miles from 35th to SoDo. If additional work was done on SoDo, that trip shouldn’t take much more than three minutes (most of it freeway). Add in another minute for acceleration/deceleration and the difference between going to a West Seattle station and a SoDo station is a couple minutes. With Delridge you could save three minutes. This is nice, but hardly a dramatic improvement. Perhaps the biggest question is whether trains can be routed from the north to West Seattle without a new downtown line. If so, how often will they come? The trains to SeaTac are limited because they run on the street through the Rainier Valley, while the Eastbound line is limited because only one train is allowed on the I-90 bridge at a time. Given that, I think it makes sense to send the other trains to West Seattle. Two minute headways from the UW to downtown (which are justified) could lead to 4 minute headways for West Seattle (and 8 minute headways to SeaTac and the Bellevue). In my opinion, this is the most intriguing aspect of this. But even with that, the chief beneficiaries of this expensive system would be the folks that live close to the West Seattle Junction. This is, by far, the area most deserving of light rail in the region. I just don’t think it makes financial sense to spend all this money on essentially one good stop. The vast majority of the folks in West Seattle will ride a bus — either to a train station or to downtown. If we improved the roads a bit (add additional HOV lanes and ramps) then the buses could just as easily, and more quickly (overall) access a station at SoDo. For the vast majority of users, this would be just as good, if not better. Ross, you’ve thought this out quite a bit in several earlier posts. I tend to agree with you completely–if there is a better alternative for less money it is difficult not to support it. A serious upgrade to bus travel into the heart of the Junction with lines able to branch off from there seems to be the most cost-effective way to serve this area. (I mean a SERIOUS upgrade; far better than anything we’ve been able to accomplish in this region to date–it should be beefy enough for potential conversion to rail should demand warrant.) I just don’t see a multi-billion dollar stub rail line being a reasonable use of extremely finite resources in the subregion with the most high-capacity needs. Thanks. I am most curious as to what the actual bottlenecks are. There are plenty of ways that the bus system could be improved. Some are cheap, and some aren’t. I wish I had a better feel for which areas aren’t much of a problem. For example, I’ve traveled to West Seattle many times, usually in the morning. I see the traffic backed up (essentially from folks heading northbound to I-5). I know there are bus lanes, but they don’t go the whole way. I assumed that the lack of complete HOV lane caused serious delays for the bus, but when I talked to my brother (a resident of West Seattle) he didn’t seem to think it was a problem. But he is an infrequent rider (he doesn’t work downtown). He also knows nothing about travel from the junction, only travel from south of there, along 35th. The factors that cause delays for the buses leaving West Seattle are 1) accidents on the bridge–If you are taking an express bus down 35th or a Rapid Ride from California/Alaska, you will sit in traffic waiting and dragging down to the end of Avalon with the cars until you can get to the bus lane at the entrance to the bridge; 2) the buses must move in a slow queue with the cars when moving from the WS Bridge to 99N, which doesn’t free up for the buses until it can access the bus lane on 99N. As the population (and traffic) in WS grows, these problems, IMO, will get worse. It has long been obvious that the bus needs its own flyover from the WS Bridge directly to the 99 dedicated lanes, and its own lane on a widened on-ramp and down from Avalon Way. The first two could probably be built for a price tag in the mid tens of millions. The last one is just paint. Ride the new Route 50 to see why 120 and C could not access SODO station as quickly as grade-separated rail could. First, congestion on the West Seattle bridge. This is the primary reason for West Seattle light rail. Secondly, at-grade freight rail crossings in SODO, and finally, the long traffic-signal wait times in SODO. On Route 50 off-peak, Delridge to the 1st Ave. exit is quicker than getting from the 1st Ave. exit to SODO station. If there can be grade-separated rail, there can instead be grade-separated bus ramps. Exactly, William. And for a lot, lot cheaper. Furthermore, some of the ramps and certainly some of the other improvements to the SoDo station could be shared by other buses. For example, if the new ramps are added to 99, then buses coming from the south (South Park, Burien, etc.) could use them, saving all of the people in that area considerable time. Any wait for trains and lights that the 1st Ave exit adds could be eliminated with buses taking the 4th Ave ramp and skipping 1st Ave altogether. Though I dislike the idea of something with so few stops, I agree that it needs to be kept on the radar. I could get behind this more *if* Metro could be convinced to extend the C and F lines into overlapping in White Center. The C should go to Westwood Village, 15th/16th & Roxbury, and the Myers/Olson Park & Ride. The F should come up to at least 15th/16th & Roxbury; adding a Westwood stop would be smart, too. The area north of Burien and south of West Seattle is badly underserved – there is a bubble around it. If you’re going to add rail to West Seattle only, we need other improvements for the White Center/south West Seattle/north Burien areas. I agree. That area is just as vital as any other spot on West Seattle. Looking at the census maps show that. This, to me, is why light rail to West Seattle just doesn’t make financial sense right now. If you serve the areas that make sense to serve (like White Center) you have a very expensive system. If not, then you leave out areas that are just as good as the ones you serve. The biggest problem, of course, is that serving that first station is extremely expensive. A huge ramp with a two (or three) mile gap between stations is just not cost effective. I think the area would be much better served with really high quality improvements to the bus infrastructure. This means added HOV lanes and ramps on the West Seattle freeway, additional bus lanes on the surface streets, and of course, more buses to areas like White Center. You can tell West Seattle that buses will be just as good and it’s what is best for them all you want, but no one will listen. They want Link. I want a free pony. We should build cost effective systems. Light rail to West Seattle isn’t part of that. It is too expensive and there are too few people there. It’s time to start admitting that West Seattle’s voting record on taxes and transportation is downright appalling. What West Seattle wants is endless special infrastructural considerations, plus free parking, plus no new residents ever, plus never contributing anything to the pot nor having to engage with the rest of the city in any substantive way. We can do without their votes or their affirmation. We won’t get them anyway. When West Seattle has a reliable, high capacity light rail service Metro should be expected to truncate their C-Line and 120 to avoid a parallel, cannibalistic and duplicated service. Option A6 should be a fallback option if a tunneled route serving (at least) Alaska Junction, Morgan Junction, Westwood, and Burien. This route will exceed ST’s ridership dreams if Metro shifts some of their service from fixed routes to DART offering commuter-time subscription service from home curbs pushing riders to stations along the peninsula spine (California and 35th avenues). The Metro Rt 128 is scheduled to re-route off California south of Alaska next year so it can provide a ‘feeder’ function from Admiral with the Rt 50 and 37 which also serve Alki. More feeders using DART can deliver at least 50 riders to light rail stations for each train departure. This service can also offer an effective alternative for Faunterloy ferry riders to leave their cars on Vashon (park-n-ride space there?) and enjoy a reliable shuttle from dock to station on a subscription basis. Auto traffic would also be reduced along Fauntleroy. While I don’t like the shortness of this line, as it serves too few in West Seattle, we need a Light Rail line and we need it yesterday. If this happens to be the route chosen, I will vote for it. But I think a line should at least go to Westwood Village. This will better serve White Center and Burien, as well as grab the folks coming off the ferry with a Morgan Junction stop. Those of you who say it isn’t cost effective now, are kidding themselves if they think that waiting will make it cost effective in the future. The topography will not change and tunneling won’t get cheaper. not be faster. Sure, the express buses are faster than the local routes, but you have to start with an on-time driver, dedicated bus lanes that aren’t very effective since they end up getting in the same traffic onto the bridge once those lines get a point where they can’t be kept separated, getting from the bridge through the antequated on-ramp to 99 can take 5 minutes during the morning rush hour, so how fast can a bus actually go? This is all aside from the fact that if anything is happening on I-5, you won’t be going anywhere fast. I have seen traffic backed up from I-5 all the way over the bridge and up to 35th as well as Admiral. Couple this with the fact that buses will have to exit at the stadiums as there will be no exits from the tunnel. That will add time too, having to travel on more surface streets downtown. It will not be faster and West Seattle will only continue to languish. Ultimately, it’s about getting a reliable, grade separated Light Rail line to West Seattle that will bypass a stall or accident on the bridge (yes, a stall alone is enough to snarl traffic), or if SDOT decides to put de-icer down when it’s too warm causing the bridge to be closed because it’s too slick. Expanded bus service is not the answer, it’s the cheap way out. Rapid Ride was supposed to be a high quality improvement and it is not. Why waste more taxpayer money on something that doesn’t better the city as a whole as Seattle is past busing it’s way out of the current, and only worsening, traffic mess. Instead, put that money towards expanded Light Rail at an expedited pace to the major areas that don’t currently have it (West Seattle and it’s South neighbors, Ballard, Queen Anne, Magnolia) before we discuss a line that won’t link it to downtown. To continue, while ST studies show that a Ballard Spur will cost less and have high ridership, I think Sound Transit needs to get Light Rail to West Seattle and Ballard with direct to downtown lines first. Patrick, Seattle Subway’s main focus is to figure out upfront exactly how Sound Transit can build stations at North Delridge and Alaska Junction in ST3, so that the Board and the public can be sure construction begins as soon as possible. Seattle Subway’s vision map shows just how much we want to see the entire West Seattle Link route built out. The constraints of spending $8 billion in the ST3 package on that route could easily see the entire route cut and the vision hard to achieve at all if we don’t figure out how to build it incrementally, but still build it right the first time. Seattle Subway wants to be sure we design for grade separation, speed, and reliability–not offered by any other modes other than rail–that West Seattle deserves by building a new rail access route. Agreed. Transfer connections from the C and 120 are key to this plan. ST will need to improve on this aspect of their design. Transferring between bus & train could take up to 10 minutes, which eats into any time savings on the grade-separated train route. Primary bus stops should be no further away from the entrance to the station escalators than the length of a double-file line at the max capacity of an artic bus. One escalator to a mezzanine, ORCA tap, another escalator to the correct platform, board train. WIth a painted line on the high-speed escalator to separate runners from standers. A turnaround/layover loop could be created for the 120/125 under the West Seattle freeway where the rail line would also run. C could loop around 44th & Alaska as currently, but with the main Alaska Junction stop aligned with a subway entrance. Since I’ve been so cranky and otherwise naysayer-y on this post, I feel that I should say that I really appreciate Ben Broesamle’s comment about thinking “incrementally“, and that the willingness to break projects down in this way is probably Seattle Subway’s strongest attribute in the Keith era. This is what makes European and Asian network expansions by and large so successful, and American ones so flawed: Eurasian planners will envision a pan-urban network holistically (paying close attention to how lines complement one another to enable the most and best trips), but when it comes to building the individual lines, they will build slowly and methodically enough to make sure they optimize every route and rider-access detail as much as possible along the way, and as much as their budget permits. Even if that means extending the network only one stop or a handful of stops at a time. What I can’t get over, unfortunately, is Ben’s last sentence. Why does West Seattle “deserve” billion-dollar, high-capacity, limited-access-point rail? That question needs to be answered soberly, and thus far, it really can’t be. The place is so sprawling, so urbanity-averse. Judged soberly, it might not be in the top dozen markets in Seattle proper for multi-faceted all-day transit usage. And unlike Roosevelt or the Rainier Valley, it isn’t remotely on the way to somewhere better or needier. West Seattle doesn’t “deserve” a subway just for a being a peninsula, or just for stamping its foot a lot and expecting the gold-plated version of every urban amenity (despite its frequent resistance to urban participation). As much as I appreciate Seattle Subway’s adoption of Eurasian “incremental” circumspection, I think the mappers over there might want to question whether any corner of a Eurasian city that looked, felt, or operated at West Seattle’s level of antiurban scale would make it onto that city’s “incremental” map in the first place. My relatively well-traveled hunch is that it would not. Even in rush hour, the Alaska Junction bound C-line gets going pretty quickly once it escapes the jaws of 3rd Avenue. This is due to a well-placed entrance to the viaduct….which is coming down soon. What will become of the C-line then? That has a lot to do with this whole enterprise — right now, the bus service to the Junction is probably “adequate” at best, if not always on time; what happens when a major piece of that infrastructure is taken out? I live in Admiral and find the lack of connection to the rest of the city incredibly isolating. It drives me mad that I physically live SO CLOSE to downtown, yet it takes me almost an hour to get from my house to downtown at any given point during the day (the only saving grace being the 56 during peak hours). I’ve never owned a car in the 9 years I’ve lived in Seattle, and that wasn’t an issue until moving to Admiral. I’ve lived in Queen Anne and Fremont, two other neighborhoods with affluent populations and with ample bus service. If it’s available and convenient, it will get used. Not to mention Alki is ripe for development and could become (even more of) a major destination if there was the right service. While we’re on it, my pipe dream is to build a bridge across Elliott Bay that connects the north end of California with the south end of 15th at Interbay… a Seattleite can dream, right? I’ve never owned a car in the 9 years I’ve lived in Seattle, and that wasn’t an issue until moving to Admiral. This sounds like a problem of your own devising. Granted, we can’t tell everyone to live where the transit is when we don’t build sufficient transit nor sufficient housing near the transit. This is true, I knew what I was getting into when we bought a house in this neighborhood. But now that we live here, I’d like to have a voice in getting more transit options. I’m all for increasing urban density. Alki could be an awesome tourist destination if it was better accessible. The Water Taxi is cute, but isn’t really a serious option if you’re paying for your own fare or don’t work downtown. This is sort of unrelated – When they build these rail lines, why don’t they build a bypass for the stations? A train straight from downtown to the airport would be great, if there was a bypass it could skip any stopped trains. And if the light rail is extended the trains going down to seatac/federal way/whereever could go straight to the airport and then become local. Because it is expensive (especially if tunneling), requires additional right of way and is generally not an effective use of limited service hours. Unless local trains are running at very high frequency already, running some trains as express would be a disservice to those at the local stops as it would nearly cut their service in half, at great cost to those potential riders. Finally geographically speaking it would probably make more sense to build those express lines in separate corridors. A line that runs south from SODO, stopping in Georgetown and then running express to TIBS via Marginal Way could make sense at some point. But such a line would not be built via the “local” lines in Rainier Valley or W. Seattle. The same could be said about any potential northside express line. I know this proposal is attempting to be circumspect, but I just can’t get past the “meh”-ness of the proposition that West Seattle is an urbanizing megalopolis in demand of multi-billion-dollar high-capacity transit. West Seattle is sprawling. It is commuter-oriented but otherwise tends to shrink from the city, culturally and economically. Its voting record is as anti-tax and anti-transit as Magnolia’s. It is weekend-backyard-BBQ land. Even the Junction is relatively small and sleepy, with 5,000-sq-ft single family lots a block to the west, and a (comparatively tiny number of) totally garage-oriented six-story breadboxes to the east that constitute the majority of the “growth” this quadrant is likely to see anytime soon. Why is West Seattle inevitably singled out for expensive special considerations, when it arguably has some of the least-bad (and hypothetically easiest-to-fix) bus infrastructure in the city today? In a framework that calls for not one, but two lines to Ballard, I’m not sure why you think West Seattle is “singled out” here. I continue to doubt that two lines to Ballard will be found in ST3, or ST4, or possibly ever. And with Denny at a standstill, First Hill getting the sampler platter of mediocre transit consolations, and the Central District* seemingly a permanent afterthought, I wouldn’t place additional nodal-theory lines to Ballard at the top of my priority list either. We need light rail to West Seattle, but shouldn’t wait for Sound Transit and their nonsensically long processes. Hard to get excited about something that won’t happen until the 2030’s. I agree it’s irritatingly long – but do you have a workable idea for how it could be constructed faster? I would also move the station 4 blocks east from the Junction (which would be extremely disruptive to build) to the intersection of SW Alaska and Fauntleroy (the SW corner of which consists largely of open lots). A lot of the TOD projects are underway in this area and would benefit from the close proximity to rail. Maybe Admiral could be served with a branch from this line? We know already that at some point the downtown tunnel will be at capacity, which is one reason why there has been much written about making the Ballard – UW line transfer at the UW station. So, how about sort of echo that here? 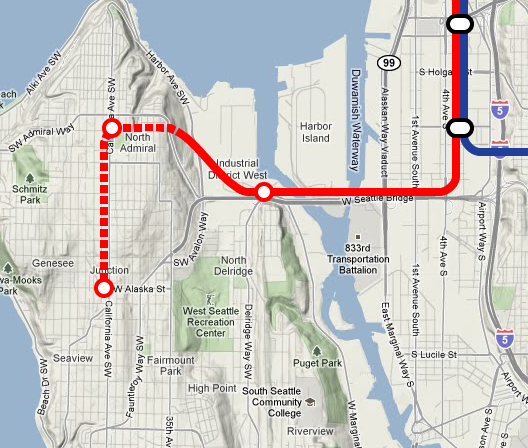 The Admiral line would allow transfers at the North Delridge station on the line shown here, and then continue east on the existing line through Sodo and then use the EastLink line to get to Bellevue. This gives additional trains to the Bellevue – Seattle corridor, doesn’ run additional trains through the downtown tunnel, and gives Alki residents access to three lines via easy transfer points without going into downtown directly. The added flexibility might generate more riders from there than would ne expected from a downtown only line. The limits for East Link have nothing to do with downtown tunnel capacity. Due to the track configuration you wouldn’t be able to go directly onto East Link from SODO without making a reversing movement at ID station which really doesn’t help downtown tunnel capacity.. The ridership on East link just isn’t that high. Trains every 9 minutes are way more capacity than will be demanded even in peak for well into the future. There is also a grade crossing and may be limits to how many trains can be on the I-90 bridge at the same time. The real issue is one of geography, the people and the demand for transit are North of Jackson. West Seattle, the East Side, and the Southern suburbs are just too spread out and too low density to serve well or cost effectively with rail. Be careful what you wish for — ridership projections for Central Link weren’t initially “that good”, and now look. Ummm… We have two-car trains running at 10 minutes most of the time with empty seats. Ridership is growing steadily, exceeding just-prior-to-opening projections but falling well short of the optimistic “magic TOD”-based projections that helped sell the line. Central Link is doing just fine. Better than Minneapolis. Worse than Phoenix or Houston. But don’t pretend we’ve got a home-run urbanist game-changer on our hands down there. Expectations for East Link are a bit disappointing, but they follow from the line’s drawbacks and the limitations of the places served. If North Link will attract enough riders to “max out” the Third Avenue Tunnel without a Ballard-UW line feeding it, IT CAN’T ACCOMMODATE THE RIDERS a Ballard-UW line would feed it. At least not without hiring some experienced packers from Edo or Ciudad de Mexico. Everyone needs to bear this in mind when we discuss “options for Ballard”. Sorry, but this is fantasy. No possible interpretation of Sound Transit’s most optimistic ridership numbers equates to crush capacity on 4-car trains with 3-minute headways. Having to stand up for 6.5 minutes of your journey does not mean that your vehicle is “maxed out”. This will be one of the lessons that must be learned when Seattle becomes a city. I agree with your math. All I’m saying is the people keep saying the “the tunnel will be at capacity when North, Central/South, and East Link are completed”. So you guys are saying that ST will be running trains that they don’t need. I can’t say I disagree with you, BUT, the rhetoric of “the tunnel will be at capacity” implies that the trains will be at least comfortably full. If the Ballard-UW line intercepts as many bus routes as people are saying, that “comfortably full” will become “uncomfortably overcrowded”. Back during the Ballard – UW discussion the tunnel capacity was used as a reason to not have those trains in the tunnel into downtown. To me it seems like a good idea since it seems to me that UW to downtown will demand more service than north of there. As for Bellevue not needing additional service beyond base Eastlink service, Bellevue has some fairly good sized office buildings in it. It seems like it could be just as valid a destination for those that live in West Seattle as anywhere else. Bellevue may not have density by Seattle standards, but Beaverton is an auto based wasteland by comparison, yet both MAX blue and red line trains go there to meet demand over base blue line service. It is hard for me to imagine Bellevue needing less service than a truly density adverse place like Beaverton does. As to the track configuration problem, there are several different ways to solve that, all of which involve adding a bit of track. It isn’t as if junction reconfigurations are unheard of. All three major MAX reconfigurations were done during night work so nobody really noticed. The 9 minute headway on the I-90 bridge seems insane to me. It’s about 6,600 feet long. Even if limited to one train at a time, 3 minute headways at 45 mph still means 2.25 miles between trains. That’s around twice the length of the bridge. If service gets to the point 3 minute headways are needed over the bridge, other changes will be needed. Nobody is looking for a one seat ride between West Seattle and Bellevue. Since the trains skip downtown nobody in either West Seattle or Bellevue will ride them. The junction south of International District isn’t level. The trackage to Bellevue will diverge from South Link and rise up the existing bus ramps to the elevated roadway leading to the reversible lanes. It’s not as easy as just adding the third side of a wye. IMO, the Crossing of the Duwamish should be further south, around Andover Street, with the North Delridge station at Delridge/Andover. This allows you to skip the Ramp spaghetti further north and increases the walk shed of the North Delridge station. I’d also throw in a station at the Flaunteroy/Avalon/35th Ave SW triangle and have it terminate at Morgan Junction. Yep. Morgan Junction. The plateau of West Seattle’s second-busiest location. That should tell you something about the value of exorbitant rapid transit investments in this part of town, no? I’m not really as obsessed about cost, short-term value, or belittling people who don’t think exactly as I do. If we want a holistically functioning urban transportation system, we should be forever vigilant about costs, about respecting the principles of transportation geometry, and about assessing value both near-term and long. Sometimes that requires doing more than drawing lines on maps to staggeringly dull places of little immediate or transfer value. Sometimes it’s more important to call out spades as spades — and to call out transit-averse quasi-suburbs as transit-averse quasi-suburbs — than it is to be nice and polite and let stupidity foster useless transit-investment proposals. I’ve often wondered if we should move the proposed rail line off of the West Seattle Bridge corridor. Moving it south could be very beneficial. I’m no structural engineer but I think it should be assessed as an idea. There isn’t much density at this proposed Delridge stop today and a stop further south on Delridge would have more residents within walking distance. With this proposal including a tunnel already, why not just tunnel east-west somewhere between Genesee Street and Hudson Street to West Marginal Way? That would be a straight shot for a boring machine. It may even be feasible to tunnel under the Duwamish or put in a ped-bike-rail drawbridge at the Duwamish. It would have some right-of-way issues in SODO but that could be overcome. One thing is for sure, ST should look at more lower cost solutions rather than go all the way to Burien because the current ST cost estimates for rail are just too costly to realistically put on the table. Taking this east-west idea one station further, perhaps we could create a passenger-only or passenger/car ferry terminal end station on the shore, enabling the ferries to feed the line. It might be cheaper to do that than to extend a rail line all the way down to Fauntleroy. Partnering with other transit modes should be on the table – but every operator seems to want to solve their transportation linkages on their own in this town. I don’t think there’s enough room at Genessee or Andover for a bridge to transition to a Tunnel right at North Delridge, it would likely have to be elevated right at the station itself, but it would be lower (and thus simpler) than one right at the West Seattle Bridge. A Gennesee tunnel would likely have to be fairly deep (I think at least 100 feet under the channel) and probably more expensive. A very popular trick. Cut project boundaries at the right point to preserve a passing cost-benefit ratio. Funny. I see it precisely the other way around. I think itemizing costs for distinct, major segments is quite helpful to the public discourse, and that the failure to do so thus far is one of the reasons why the public discourse has been so roundly clueless and groupthink-y. Knowing precisely what a new downtown tunnel would cost — and what it would look like — would be vital to understanding whether it becomes a worthwhile investment in proportion to the discrete trip pairs it does or doesn’t enable, to the places that do or do not become easily reached from within it, or by transiting through it. One might even find that the downtown tunnel itself, portaled to expedited buses from Uptown and Aurora and all parts of West Seattle, might become more valuable than any multi-mile radial tunnel that reaches only one or two overhyped nodes. So maybe the best investment in Seattle for ST3 is a rail convertible downtown bus tunnel. With the experience they’ve gained in building SoundMove and ST2, maybe ST can build in embedded rails that they don’t have to rip out and do over in the future. How much tunnel can you get for $8B? I suggest LQA to the OMF and then expand outward from there with any leftover money. Maybe it gets as far as Ballard, maybe it gets to West Seattle. Maybe we’ll be lucky enough that it could reach both. Having buses in the tunnel would repeat all the inefficiencies we’re currently having. Trains having to sit and wait while wheelchairs get off buses. Lower tunnel capacity and slower boarding. Trains weaving between bus bunching. ST might likely refuse to do it again. In the case of a West Seattle line a second downtown tunnel is absolutely not necessary and for that reason alone shouldn’t be included in cost estimates. The 3 “southern lines” could manage running at 9 minute frequencies (combining for 3 minute frequencies on North Link) for for the foreseeable future. And those frequencies could presumably be reduced to at least 6 minutes with the relatively cheap construction of the Montlake vent shaft. Moreover, including the cost of a downtown tunnel ignores other potential routing combinations through that corridor. Rerouting East Link to terminate at Westlake (or beyond) via Little Saigon and First Hill (therefore permitting increased frequency to W. Seattle) would probably be cheaper and far more productive then building a second downtown tunnel. But such an idea would be off the table if we couldn’t separate largely distinct geographic corridors. The original downtown bus tunnel allowed passing, and managed to reach exponentially more destinations in 1990 than our lame nodal starter rail will be able to for the forseeable future. I even like Alex’s idea of using some of the money saved on pointless multi-mile ROWs to remote and middling-size commercial district to consider fixing First Hill or the C.D.’s access problems once and for all. There are situations in which true subways are indispensable, and there are situations where a sort of “bus pre-metro” network could actually make a great deal of sense. Please don’t turn into such a rail fetishist that you might wind up harming the cause of real access and mobility. I see a second tunnel as being necessary for Ballard-downtown. At the very least I’d like to see the cost estimates for the tunnel segment and the ridership estimates when a downtown tunnel is analyzed with the various non-streetcar Ballard-downtown options. For the streetcar options to Ballard I’d like to see the ridership estimates with the central city connector included. d.p., unfortunately there’s no reply link under your post. 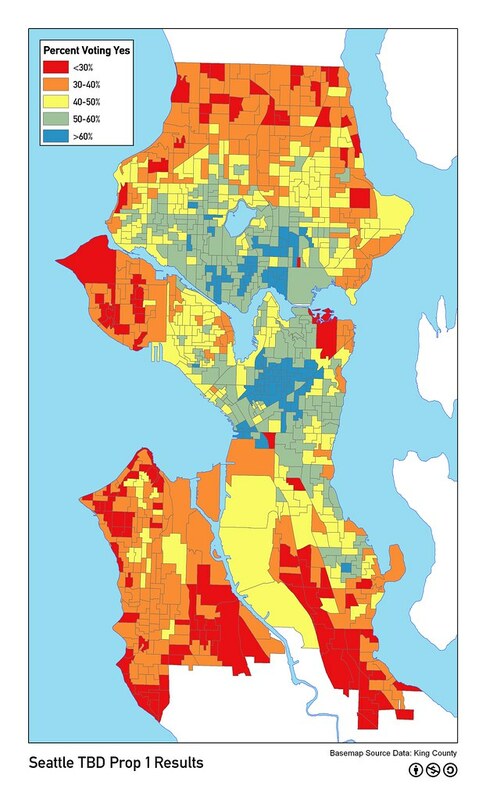 But I just wanted to point out to you that the map you linked to in order to show West Seattle is transit-averse, is for Seattle Proposition 1 in the 2013 General Election. As far as I know that had to do with campaign funding, so I’m not sure how that ties in to transit? West Seattle didn’t do quite as badly, although I was a little disappointed it wasn’t better. I meant that Seattle Prop. 1 in the 2013 General Election was about campaign financing, not funding. d.p., this is in response to your last post in this thread regarding the quadrants. Yes, as I said I was disappointed with the West Seattle votes for transit funding, even though they weren’t as bad as the original map showed. I don’t think that everyone or even most people in West Seattle has the attitudes you mention, but certainly there are people who feel like that, and many of them comment on the West Seattle Blog. I hope that there are a lot of people who don’t feel that way who don’t comment on there–at least that’s what I keep being told when I comment density-phobes or similar on the WS Blog. That said, I think you and several other people who have commented here are right that West Seattle isn’t dense enough for rail, at least not at this time, and there are a lot of other areas that are more dense and should be considered first. I appreciate your acknowledgement. I know I can come across as prickly or even arrogant when presenting counterpoints on this blog. But really I am just frustrated that the groupthink surrounding which neighborhoods do or don’t “deserve” rail often has more to do with symmetry on a map than it does with the realities of transit geometry, or with the different patterns of transit usage that arise from contiguous urbanity versus geographic isolation. I don’t have to be the biggest fan of the archetypal West Seattle “personality” (which, in my experience, seem to involve a false conflation of “adulthood” and “the good life” with “turning your back on the urban sphere”) to think that West Seattle deserves truly effective transportation access. I just severely doubt that effective West Seattle transportation access can be achieved with even the most gold-plated of trains, now or for the foreseeable future. When you don’t see a reply link on a third level comment, go back up until you find a reply link and use that. It’s always helpful to identify which comment you’re replying to because the third level comments to a long string can be confusing. Thanks, I’ll do that from now on. Ah, okay. It’s good to know that basic transit preservation can still maintain a majority in West Seattle, although the spread seems about 10-15 percentage points tighter than in every contiguously urban-ish swath of the city north of Rainier Beach and south of Northgate. Which is consistent with West Seattle’s failure to support the capitol and maintenance projects in 2011’s proposition, while many transit-oriented parts of the city voted slimly in favor. Obviously, I don’t think much of West Seattle from an urbanism standpoint, so it irks me when they are presumed to be in or near the front of the line for massive investments that arguably simply do not make sense for their urban geometry, for little more than the sake of symmetry. One of these quadrants is not like the others. I like the idea mentioned earlier of having stops along California Ave.
Maybe this is a bit off topic but I’d love to hear from someone involved with Seattle Subway why they don’t seem to be interested in serving First Hill, Little Saigon or the Central District? These neighborhoods are all pretty dense and First Hill is extremely dense. By almost any metric only a handful of neighborhoods (excluding neighborhoods where light rail is already being constructed) are more deserving of HCT than First Hill and yet it has no stations on even the most speculative maps. Was there a study that stated that no station serving First Hill could be built under any circumstance due to engineering reasons? Either way I think this is a solid idea. But its important to get the priorities straight. Especially considering that a Duwamish crossing is going to very expensive, this line can’t really stack up to a Ballard-UW line, or a line that serves some combination of QA, SLU, Belltown, First Hill, Little Saigon, the CD, Rainier and either Westlake or Capitol Hill. And I’m not even sure it is of greater importance than a UW-Magnuson Park Line (that could be extended to Kirkland and the greater eastside). It would be a real be a shame if this line got built at the expense of getting HCT to those other neighborhoods. Alex, Seattle Subway is an all volunteer group with scant resources (no money for engineering studies). So we’ve been focusing on those corridors already studied by the Monorail Authority, the Transit Master Plan, or by Sound Transit. That said, once our outreach season is over (summer) we plan to focus on updating our ‘vision’ which will likely include an eastern line through Seattle. The engineering studies for U-Link concluded that the particular alignment proposed with the belly south to First Hill could not be constructed without significant risks. Does that mean that no alignment through First Hill can not be found? Probably not. The problem is, though, that any alignment which serves the top of the hill either must have a very deep elevator-only station or must pass north of the city’s core, necessitating a transfer to access the central or southern parts of downtown. Why would people do that when they could take an ETB directly down the hill? The original proposed alignment of Link of course avoided the problem by using the bus tunnel which itself bends south through the core to the International District. But that ship has sailed. You mentioned “and either Westlake or Capitol Hill” presumably identifying those stations as the transfer points to U-Link/Central Link. It seems to me it would have to be Capitol Hill because the “good approach” to First Hill from the CBD along Pine is already occupied by the bus/Link tunnel. Perhaps a new subway could be built under Olive Way and transfers be accommodated at the mezzanine level to Westlake, but that’s an additional block from the core, and the First Hill tunnel would have to dip under the U-Link tunnel somewhere around Ninth Avenue after it rises up to cut and cover level, driving the First Hill station deeper. To make the transfer at Westlake would also eliminate any possibility of serving the South Lake Union area but it would align the tunnel through First Hill in on an east-west axis making service to the CD a possibility. Having the transfer at Capitol Hill makes it possible to serve all three “NoDo” areas: North Queen Anne, northern Belltown and South Lake Union in a fairly direct manner. It also makes the transfer more direct. A station box angled northwest to southeast directly under the Capitol Hill box would be optimum. However such a transfer point would align the First Hill tube on a more north-south axis making service to the CD pretty roundabout. Finally you mentioned “Rainier” by which I gather you mean the Rainier Valley. But the Rainier Valley already has a surface Link Line and there is no chance in hell that the voters are going to pay for a subway a half mile east of it. Should Central Link been built in a subway under Rainier? Probably so, but it wasn’t and none will be built there. And last but not least, diverting East Link to this routing (instead of sending the new line down Rainier) would mean that suburban riders from the East Side would be transferring at Capitol Hill or Westlake in order to get to the offices around University Street. That simply would not fly. What I got out of Alex’s list of potential destinations was a vision of a sort of Denny-Boren-Jackson-23rd crosstown subway. Which, though expensive, could prove a pretty great idea in the long run — it hits an awful lot of busy places that will remain excruciating to access even with U-Link complete. I would certainly advocate for this before I advocated for building two different lines that end in Ballard. Of course, the transfer point between the downtown spine and the downtown-skirting line would be the stickiest problem to resolve. Shame on Sound Transit for being so urban-spacing-averse that they’ve made a Pine/Melrose infill station impossible. Playing with trains again boys? Those times I have visited West Seattle I was strum by how much development has happened along the waterfront. I’ve been told that there are foot ferries in Europe that are modernized to the point where only one operator is required, and this they are quite cost effective. Maybe the real solution here is modernization of the water taxi and really good timed transfers? I think the water taxi idea would need massive upgrades in bus service to the boat landings to be effective. There is now a shuttle that gathers people from a small kernel of West Seattle, but for most, it requires taking a bus to get to the shuttle. This is not only a cumbersome trip, but somewhat difficult to time and plan as the shuttle runs on the boat’s schedule, waiting when necessary. Then, on the downtown side, there is a walk to whatever connecting bus you might need to catch. If this is to be done two ways, every day, it’s got to be a lot smoother. why not all the way to Burien and on to SeaTac?